We have 2 spots available for August! To that I say, if my cover image of cupcakes is any indication, you should not be listening to anything I tell you about nutrition and fueling while training. You know those people who run with belts wrapped around their waist with tiny water bottles attached and tubes of GU strapped to their sports bra? My "strategy" for fueling while training is to make laps around my apartment complex and stop in to grab a drink of water if I feel thirsty. Or, alternatively, I leave the apartment and run three or four or five miles away, and then get thirsty and keep going until I'm home, wherein I collapse on the ground. While Jordan stands over me concerned, I mime motions for "GET ME WATER NOW" because my mouth is too dry to form actual words. I need a more legitimate plan. I have problems. I do have a Pinterest board titled "Fitness Foods," so at least there's that. 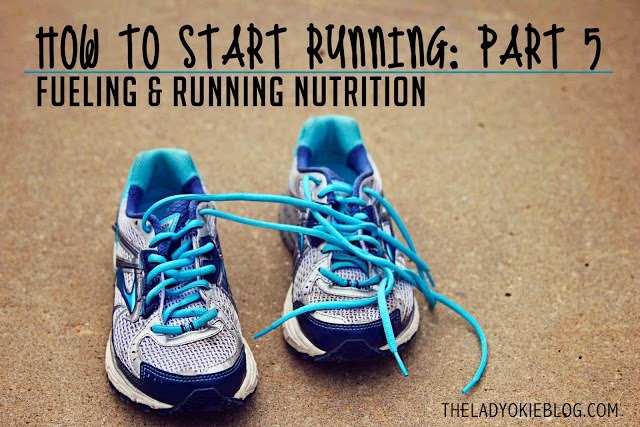 And actually, I covered the topic of fuel & nutrition during part 5 of my "how to start running series." Click on the picture below for the full post! While you're at it, check out the entire 7-part series if you haven't already. I cover a bunch of topics from getting started to gear to setting a training schedule to some running FAQs. One thing I always do after a run is make sure I eat some protein within the first half hour. This helps muscle recovery. In case you're interested, I reviewed 4 different types of protein bars in this post. Basically you want to find something that provides a good amount of protein without too much sugar or calories. Which is why all the best protein bars taste like candy and are loaded with sugar. [Insert sad face emoticon.] Anyway. Now it's your turn! Link up below with your nutrition and fueling tips and tricks. I'm sure anything you say is going to be better than the nonsense I just said. *I am not a dr. or dietician. This post is not meant to offer medical advice. But it is telling you to eat more cupcakes. Amen. Give us the scoop on your day-to-day running. Are you a social runner or do you like to take it solo? Do you run in the morning or evening? How often do you run? Maybe take your camera on your next run and snap some pictures to share! Pass along any handy training tips or advice about how to make sure you get up in the morning or how to safely run at night. 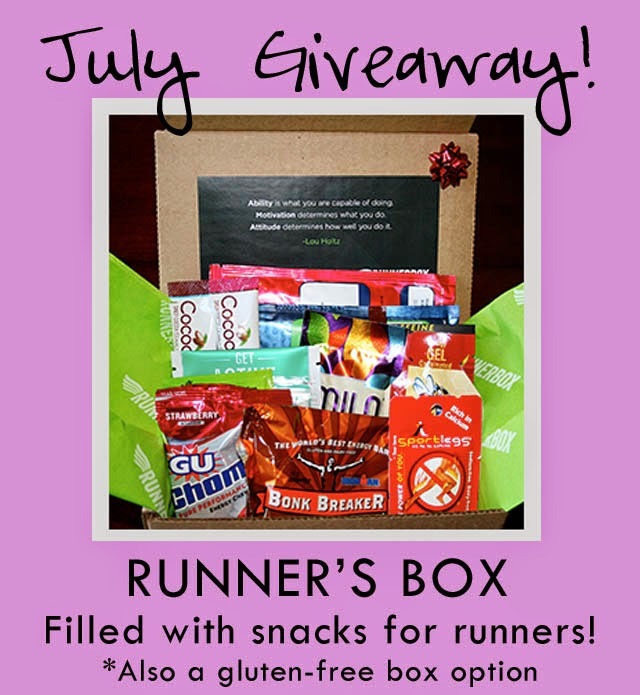 This month we're giving away 1 Runner's Box gift box. This is a monthly box subscription filled with snacks and fuel for runners. The winner of the giveaway will receive a 1-month gift box. There is also a gluten-free box option! Unfortunately, they only ship within the continental United States, but if you're international, feel free to enter. If you win, we will work with you to get you a prize of equal value. We don't want you guys to feel left out! Once the giveaway is closed, we will email the winner. Entries will be checked, so play fair. A training plans of cupcakes sounds like good advice to me! Protein cupcakes? Is that a thing? Well you should invent them if it's not! Thanks for hosting, can't wait to link-up! Belt people seem so legit to me! Maybe one day, I will own a belt of my own. Meanwhile, I choose a hydration method similar to yours: I leave a water bottle in my mailbox and loop by my house when I am thirsty. It's also my clothing drop-off spot. I'm sure the mailman loves cramming mail into my already long sleeve t-shirt-gatorade-water-glove packed mailbox. 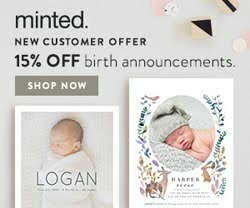 I'm so excited to sponsor this month's linkup! Thanks for hosting! ditto to ALL OF THIS. when I got a belt, I immediately felt bona fide. and when I do hill workouts at my parents' house - because they live on a hill - I leave my waterbottle at the end of their driveway so I can swing a chug every time I pass. mmmm, maybe if I ate a little better I would runner a little better. I didn't fuel well forever because so many gel and gus make me puke. It's all about trying different stuff until something works! I treated the whole water thing the same way as you when I ran my last 10K (because in the past I NEVER stopped to get water along the way). Moral of the story is that when you run injured, you run slower, and when you run slower, you spend more TIME running...and after a painful HOUR of running I thought I was going to die considering I drank nothing. So yeah, I need to work on my fuel for next time. Sounds like we have similar nutrition plans when it comes to running. I usually text Daniel when I'm close to home and ask him to fix me the biggest glass of water ever, haha. I just started a couch to half marathon plan! I didn't realize you had a "how to get started" series, but I am super excited that you do, because I'm going to need all the motivation I can get later on. I'm SO BAD about drinking water DURING my run. I'm always at the park, and I HATE carrying stuff. Soooo.. I just wait until I get home. Whoops? Also, if we could create a training plan around cupcakes, I would NEVER STOP RUNNING EVER. Yum, donuts! 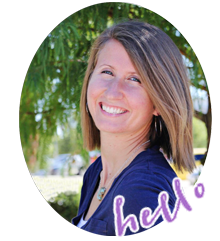 Thanks for hosting the link up again, enjoy your blog-cation! Oh girl!!!!! No more donuts!!!! Fuel up - it will make a world of a difference! I'm definitely with you on the not so much of a fueling strategy.. but water is a must! Haha! The cupcakes were a good picture to add. I don't think I could make it without water though. i'm discovering that i need a water bottle bigger than my 10oz handheld yet smaller than my 70oz camelbak for runs in the 3-8 mile range! Haha! You are hilarious. 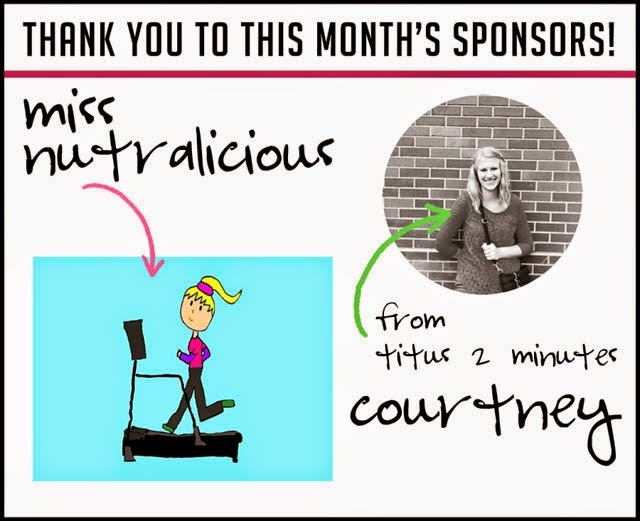 I mean, isn't the whole point of running to be able to eat more cupcakes? I have the really funny visual of you collapsed and begging for water! Hope no one is offended by my approach to the topic. I'm one of those people who runs with gu and water and all kinds of things strapped to them, but I still feel like I don't really know what I'm doing when it comes to running + nutrition. I had it all figured out for a while, then my body decided it didn't like what I was feeding it anymore. It's an ongoing thing to figure out what works and what ain't cutting it. And I fully support your liberal use of cupcakes! I love this post. Cracked me up!! I'm totally one of those belt people ;-) feel like I've nailed down the running and fueling over my past two marathon training seasons. I need to blog about it... But you know, cupcakes are simple sugars your body could use right away. Maybe it could be the new gu. 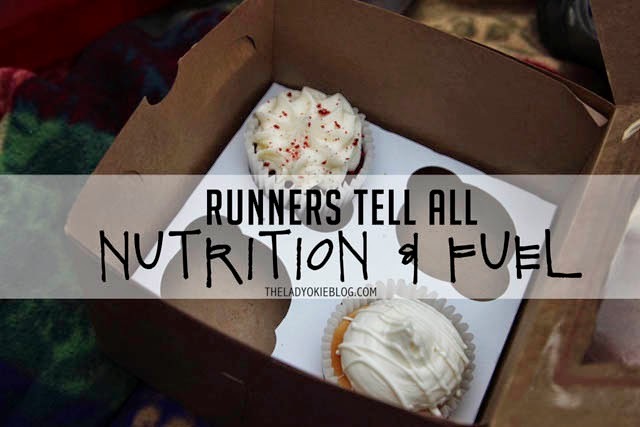 Also, don't we run to be able to eat things like cupcakes? Haha. I'm the same way when it comes to fueling or hydrating during runs! And hey, cupcakes are an excellent choice post-run. Mmmmm. Now I want a cupcake. With a glass of milk (I suppose water would do). 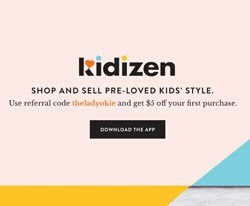 Thanks for hosting this, Amanda! I's so interesting to see the similarities and differences between everyone's routines.